We will be doing complete coverage of the devices announced today on TechzTalk. Foo Fighter are on stage for the final sendoff. Tim ends the event by saying "Now when you look at each of these, they are incredible industry leading innovation by themselves. But what sets them apart and what places us way ahead of the competition is how well they work together. Only Apple could do this. Apple has never been stronger. And that's because of our employees. They are doing the best work of their lives." Tim Cook is back on stage recaping what Apple has introduced today. New iPod nano and iPod touch will ship in October. Older iPod touch models will be available at the same price. iPod Nano will be priced $149 for 16GB, new touch will be priced $299 for 32GB and $399 for 64GB. However Apple will include these new Earpods with iPod touch, iPod nano and iPhone 5. Apple will ship these Earpods as standalone accessory starting today. Introductory vidoe for Earpods playing with Jony talking about the completely new design. Now Apple is introducing redesign earphone which they are calling Earpods. iPod touch will come in five colors. It has Wifi 2.4GHz and 5GHz and Bluetooth 4.0 with LE. It also support Airplay mirroring with iOS 6. There is a button on the back of the iPod touch called loop that pops out with a little wrist strap. iPod touch also get 5-megapixel camera, HD iSight camera and iPhoto support. Battery life on iPod touch has also increased to 40 hours of music playback and 8 hours of video playback. It's gaming demo time for iPod touch. It has the same 4-inch display like the iPhone 5 and A5 chip. Now iPod touch, it's just 6.1mm thin and it weighs just 88 grams. iPod nano has pedometer, Bluetooth and Lighting connector. It also has a home button like iPhone. it will come in 7 colors. The new nano is just 5.4mm thin and has 2.5-inch multitouch screen. He starts with Nano and says "First we want to give it a large display. Give it nice controls. Make it thin and light. And of course, the Lightning connector." Apple says iPod is the most popular music player and they have sold 350 million units till now. The demo is over. New iTunes will be available in October. iCloud is completely integrated with iTunes and so it syncs playlists and other bookmarks. The mini iTunes player is also enhanced with drop down feature. iTunes actually looks much cleaner with drop down search and menus. Apple has given the artist the ability to share photos with you in your library. Here's some photos Coldplay is sharing. Completely new edge-to-edge design inspired by iOS iTunes app. He finally announces the new version of iTunes and starts the demo. He is talking about update iTunes, App and Books store for iOS 6. Tim invites Eddy Cue on stage to talk about iTunes. Tim is back on stage and says "This is the biggest thing to happen to iPhone since the iPhone." iOS 6 will be released on September 19th. It will ship on 21st in US, Canada, UK, France, Germany, Australia, Japan, Hong Kong and Singapore. Pre-orders start in September 14th and it ships on 21st September. iPhone 5 will remian at the same price $199 for 16GB, $299 for 32GB and $399 for 64GB. Jony, Bob and other Apple executives are talking about various iPhone features and improvements in the iPhone introductory video. Phil is showing iPhone 5 video. iPhone 5 will come in Black and White colors. Phil is back on stage. Now enhancements to Siri. Scott is doing a WWDC rerun. Passbook can have movie ticket, a boarding pass, a card from Starbucks and coupons. Basically he is repeating the features that Apple showed at WWDC. Now it Mail and Passbook. Now he is showing enhancements made to Notification center and Safari. He is also showing turn-by-turn directions with satellite imagery. He starts with maps. "We've built a search engine in to find POIs — we have over 100m points of interest." Phil is of the stage and Scott is on the stage to show iOS 6 features for iPhone 5. Apple has also launched adapters for the new connector. The connector is all digital with adaptive interface and is 80% smaller. Now the connector - Phil announces the new Lightning connector. Phil is talking about the new improved speaker design that offer wideband audio for better listening. Facetime on iPhone 5 supports 1080p video chat, but the front iSight camera on the phone is only 720p. Phil says the most amazing new feature of iPhone 5 camera is panorama. The camera app guide the users to take panorama shots up to 28-megapixel. Now he is showing some pics take with the new iPhone 5. In combination with the A6 processor the new camera offer better noise reduction, better low-light performance. It also has precision lens alignment, sapphire crystal. Apple has also update the camera on the new iPhone 5. It has 8-megapixel backside illuminated sensor, Hybrid IR filter and f/2.4 aperture. iPhone 5 will give 8 hours of LTE battery life and up to 40 hours of music playback. Phil is back on the stage talking about battery life. The car racing game looks good. You can even see the car behind you in the rear view mirror. Now there is a game demo by EA to show the graphics horsepower of the new iPhone. Almost everything is 2X faster because of the new processor. iPhone 5 will come with new A6 processor that has 2X CPU and graphics horsepower. Also the iPhone 5 will now support both 2.4GHz and 5GHz WiFi. Phil is now talking about all the carriers that support LTE around the world and that will have iPhone 5. Apple is using Single Chip, single radio with a dynamic antenna to bring various LTE frequencies in such a small device. And yes it also has LTE. Phil claims "This is the most accurate display in the industry. The touch sensors are integrated right into the display itself. We removed a layer and made it sharper. This is the world's most advanced display, and I couldn't be prouder of it." Not only has Apple increased the display size but they have improved the display also with 44% more color saturation and integrated touch. Phil adds that it easy for developers to update their Apps for the new display and because of the widescreen the video looks great. All of the Apple's softwares has been updated for the new longer screen. Phil explains why did Apple make the iPhone this size. "It's because of your hand. It should fit there. That's how we designed the iPhone 5." The iPhone 5 screen is 4-inch with 326 ppi and 1136 x 640 resolution, as was rumored. It is 18% thinner at 7.6mm than iPhone 4S and 20% lighter. The iPhone 5 is just like the leaked image, but it looks awesome. Phil says it is the most beautiful product we have ever made. Phil says today we are introducing iPhone 5. and the crowd goes boom..
Tim invites Phil to talk about the iPhone. He announces Apple has sold over 400 million iOS devices and today Apple is taking a huge leap. Now the App Store - it has over 700K apps, out of which 250,000 are for the iPad. 90% of the 700k apps are downloaded every month and the App downloaded per customer is over 100 apps. 94% if Fortune 500 companies have deployed iPads and they are investing in custom apps. Apple has overall sold 84 million iPads and has 68% of tablet market share. Now iPad, Apple sold 17 million iPads last quarter. He adds "Now to put this in perspective, we sold more iPads than any PC manufacturer sold of their entire lineup." Now he is talking about the Mac and says that Apple sold 7 million Mountain Lion copies. And Apple notebooks now rank #1 is US. Tim is back and he says our stores are the best and they offer the best experiences on the planet. There are now 380 stores with over 83million visitors. He shows a video of Barcelona store launch. He starts with Apple retail store update, talking about new Barcelona store. Well the lights are down and Tim is on the stage welcoming everyone. Music is going down and Apple announces to switch devices in silent mode. Just moved in looking for our seats. Still outside with the large crowd. As always long line has formed for an Apple event. We have slowly started moving. 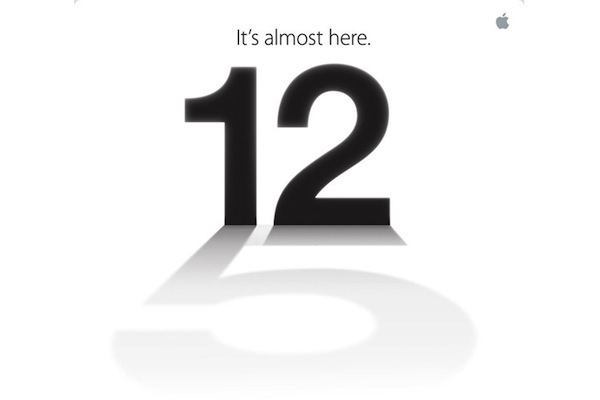 Apple will be holding their much awaited iPhone 5 launch event today (September 12) at 10AM PDT/ 1PM EDT, at Yerba Buena Center in San Francisco. Rumors are Apple will announce the new iPod lineup along with the much-awaited iPhone 5. We will be doing a live coverage of the Apple media event on live.TechzTalk.com, starting at 10 AM PDT/ 1 PM EDT / 6:00 PM London / 2:00 AM Tokyo. Please join us to get the latest Apple news on live.TechzTalk.com.